Rich’s and its Magnolia Room restaurant are no more, but here is one of the recipes that made it famous. Rich’s always did a three-layer cake, with two layers of coconut filling, but some home cooks don’t have three pans of the same size, so two would work just fine. Preheat oven to 350 degrees. Prepare cake pans by lightly greasing with shortening, then dusting with flour. In a large bowl, mix the flour, salt and baking powder. Set aside. In a small bowl or measuring cup, stir the powdered milk into the water and mix until dissolved. Combine the liquid milk with the powdered milk/water mixture and set aside. In the bowl of an electric mixer, cream together the shortening and the sugar until fluffy. Add the eggs, one at a time, beating well after each addition. Add about half the flour mixture, beating until just incorporated, and then half the milk mixture, again beating until just incorporated. Repeat this step, adding the remaining flour with the remaining liquid, and beat until just smooth (about 1 minute). Be sure to scrape down the sides of the bowls once or twice during the mixing. Pour the batter into the prepared cake pans and bake for about 20 to 30 minutes. The cooking time will vary depending on how many cake pans you use and how full they are. The cake is done when it springs back when lightly pressed near the center with your finger. Allow the cake to cool for a few minutes in the pan, and then turn out onto cooling racks to cool completely. In a mixing bowl, using an electric mixer, combine the vegetable shortening, vanilla and salt and cream together until incorporated. Slowly add the confectioners’ sugar until it forms a very thick consistency. Dissolve the powdered milk in the water and gradually add, just 1 or 2 tablespoons at a time, until the icing is a nice, spreadable consistency. Make filling: In a large bowl, thaw the frozen coconut. Set aside. Take 1 1/2 cups of the coconut and place in a smaller bowl. Combine the water and sugar and pour over this smaller bowl of coconut. This should be very moist but not soupy. Place one layer of the yellow cake on a cake plate and spread with icing. Spoon the moistened coconut over that. 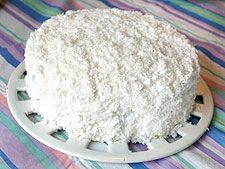 Place the next layer on top and spread with icing, spooning the moistened coconut over it. Continue this process until all your layers are filled; however, don’t put the moist filling on the very top of the last layer, as it will be iced. Next, cover the entire cake with the icing. Make sure to use a thick coating of icing to eliminate any of the cake showing through. Take handfuls of the dry, thawed coconut and press the flakes into the icing. You may want to put a tray underneath to catch any coconut that falls as you do this. Continue pressing dry, flaky coconut all over the cake until it is completely covered. Chill for about 1 hour to set (it helps the coconut to stay), and then serve. Thawed frozen coconut really does make a difference for this easy cake. You can assemble the cake when the layers are still a little warm as the shortening-based frosting doesn’t melt. While it’s good after an hour, it’s far better after a day. Per serving: 802 calories (percent of calories from fat, 59), 7 grams protein, 80 grams carbohydrates, 9 grams fiber, 54 grams fat (40 grams saturated), 43 milligrams cholesterol, 402 milligrams sodium. Thank you for re-publishing this recipe. I saved the one that was printed in the AJC April 8, 2007, and made it for the first time yesterday. I knew that something was not right, but I kept going. The batter was way too thin. When baked, the cake was gooie. After finding your post, I see that the paper printed it incorrectly. The recipe in the paper called for 1 1/4 cups flour and 2 1/4 cups of sugar, which is reversed from yours of 2 1/4 cups of flour and 1 1/4 cups of sugar. Just putting this out there in case someone else has come across this. You’re welcome. It is one of my favorites (even if not mine). Grew up on this cake. My mom made Japanese Fruitcake, which is also a coconut iced cake, but, Rich’s was my favorite.